About 10 years ago, Kartika Palar (cohort '06) was a student at Pardee RAND interested in the drivers and consequences of health inequity in people living with HIV. At the same time, Prof. Kathryn Pitkin Derose was finishing up a RAND-funded project in Central America and learned that, in Latin America and the Caribbean, food insecurity often prevented people living with HIV from adhering to anti-retroviral therapy (ART) and other treatment — but that not much work had been done to address this problem. Their mutual interests led Derose to mentor Palar in several On-the-Job Training (OJT) projects. After graduating, Palar continued to work with Derose, and their decade of teamwork recently brought in another member of the Pardee RAND family, student Gabriela Armenta (cohort '15). Together, the three women are now making a difference in the Dominican Republic. In 2008, Derose contacted some colleagues at the World Food Programme's Bureau for Latin America and the Caribbean (LAC) who were also interested in addressing food insecurity and HIV treatment adherence, and they developed a long-term partnership working in several LAC countries. "Kartika was a key project team member across various studies we did," Derose said. "She did an independent study on the topic with me and then she developed her dissertation, Food Security, Livelihoods, and Antiretroviral Therapy for HIV: Evidence for Policy in Resource-Limited Settings. The last country where we started working on this was in the Dominican Republic, around 2012." When she finished her Ph.D., Palar received post-doctoral fellowships from UCLA and UC-San Francisco, allowing her to continue her work with Derose. "She led a key qualitative study that informed one of the novel components of the current intervention," Derose said. A few years later, the team had enough preliminary data from the Dominican Republic to submit a proposal to the National Institutes of Health. 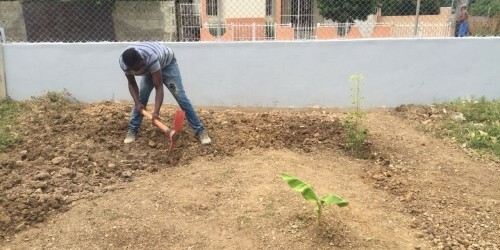 Derose was awarded the NIH grant, Improving ART Adherence through Urban Gardening and Peer Nutritional Counseling in the Dominican Republic, in August 2016. Key partners in the Dominican Republic include the ministries of Agriculture and Public Health, the National AIDS Council (CONAVIHSIDA), the Universidad Autónoma de Santo Domingo (UASD), and the World Food Programme. Armenta joined the team, with Derose as her OJT mentor. Other Pardee RAND colleagues include professors Glenn Wagner and Bing Han. The first phase of the team's project involved semi-structured interviews and focus groups to inform the intervention, known in English as the Project to Improve Food Security. The name in Spanish, Proyecto para Mejorar la Seguridad Alimentaria, uses the acronym ProMeSA, playing off the Spanish word for "promise." The second and current phase of project involves a pilot randomized trial of the ProMeSA intervention. 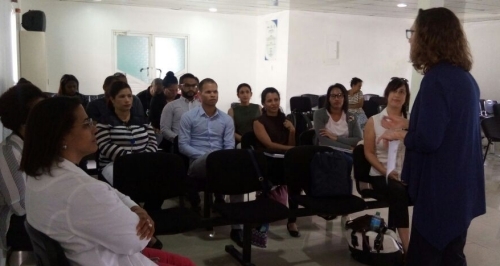 In April 2018, the team traveled to the Dominican Republic to meet with research partners from the Faculty of Health Sciences at the UASD and together train project staff in in how to administer the intervention trial. "This project has been fascinating. Unlike other OJT projects, I get to interact a lot with the people in the field and I get to travel and do actual field work. I love that part!" Armenta said. Now, Armenta is "playing a key data management and analysis role as we monitor the progress of our intervention trial," Derose said. "I am learning about data analysis of randomized controlled trials, which is something I was looking forward to doing for a while," Armenta added. "I also love coordinating fieldwork with other team members in the Dominican Republic. Katie gives me a lot of freedom and the opportunity to learn. She truly cares about me learning from this project, and she gives me the opportunity to get involved in aspects of the project that I am truly interested in." ProMeSA focuses on the effects of urban gardens and peer nutritional counseling on HIV-related outcomes and food insecurity. Additionally, a research award Palar received from the UCSF Center for AIDS Research (CFAR) will allow her to assess the effects of these interventions on cardiovascular risk among people with HIV. Palar explained that cardiovascular disease (CVD) is the leading cause of mortality in Latin America and the Caribbean, and has arisen as a major clinical and public health challenge in HIV. "Interventions to reduce modifiable CVD risk factors among food-insecure people living with HIV are critically needed in Latin America and the Caribbean, where food insecurity and obesity coexist and are highly prevalent," Palar said. 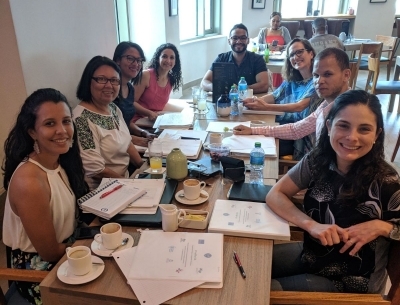 Her project builds on ProMeSA by assessing the impact of the interventions on CVD risk factors among 120 food-insecure Dominicans with HIV who receive ART, and evaluating the impact of the intervention on improving objective measures of CVD risk. The ProMeSA trial is slated to run until 2019, with analysis concluding in 2020. Palar's separate CFAR study also ends in 2019. Palar says she hopes the results of her CFAR research will help to inform policies and programs to improve health equity and long-term outcomes among people living with HIV. Derose said, "ProMeSA is a trial, a pilot intervention. 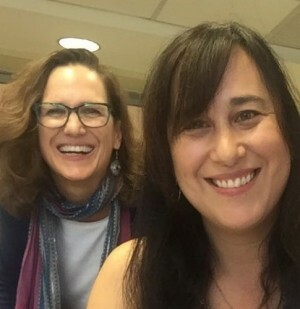 Our hope is that it will provide preliminary evidence of effectiveness and that we can then propose a larger, national study in the Dominican Republic to assess the intervention's longer term effects — actually, we hope to do two large, coordinated studies, one where Kartika is the lead and the other where I am. "We'll see where Gaby is at that time and whether she wants to continue to be involved," she said. As for Armenta's plans, she commented, "I would love to continue with evaluation of social programs focused on health and vulnerable groups. I would also love to continue doing fieldwork since I love the interaction with program participants and implementers in the field." Does she see herself working with the team or mentoring an OJT student in ten years? "I would love to continue working with them," she said, "though it’s hard to know where we’ll be a decade from now!"